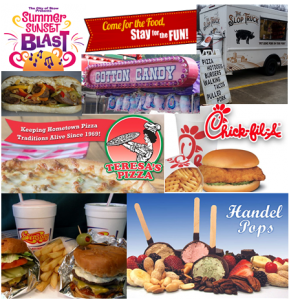 Fireworks, Beer, kids activities, inflatables, rock climbing wall, Ninja Warrior obstacle course, JOURNEY tribute band, festival food and more! Join the community for Stow’s end of Summer celebration event. Complete with the best fireworks show in the area, this event is all about Fun in Stow! All Day: Food, fun, vendors, entertainment, beer, music! 5:00pm: Party Bash w/DJ – All Night! 9:00pm: Grand Finale Fireworks Show!! All Day: Food, fun, vendors, demos, entertainment, beer, music! 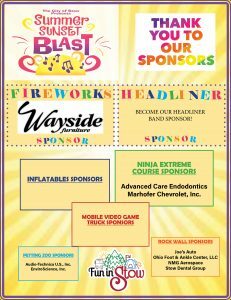 THANK YOU TO OUR 2019 SUMMER SUNSET BLAST SPONSORS (to-date)! More opportunities are still available. For pricing and information click here. The City of Stow is now accepting agreements from food, business, community group, church entities interested in being a vendor at the event. We are accepting food vendors, business vendors, and vendors who intend to promote, provide an activity, and/or sell. See Below! Event Sponsor (coming soon) Click here for Event Sponsorship information Click here to register online for a Sponsorship.